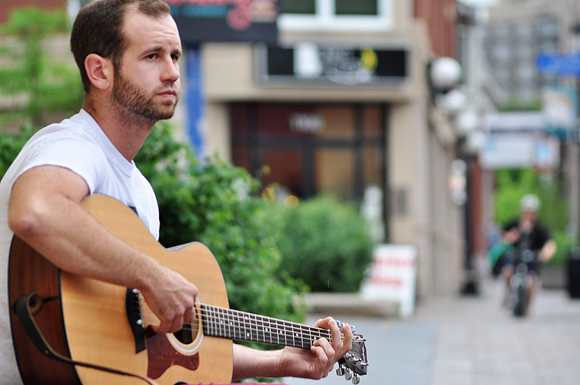 Musician Cory Levesque will soon be able to strike one thing off his bucket list. Photo by Adam Feibel. He’s only been interviewed once before — years ago — and it didn’t go so well. Levesque has never been a huge talker, having often gone several days without uttering more than a few words. Here, sipping a pint at the Elmdale Oyster House, he’s having a hard time talking about himself. But if you see him perform, you wouldn’t expect it. As soon as Levesque straps on his guitar, it’s “party mode” — a bravado born from a lifelong passion for sharing the fun of music. The 26-year-old singer-songwriter grew up in Sarsfield, then Orleans and Rockland before settling down in the Ottawa core. Now he lives with his girlfriend on Beech Street in the southeast corner of Kitchissippi, makes a living working construction in Vanier, and does what he can to keep taking his music out of town. Many people will say they love to travel, and so does Levesque. But he puts it differently — he likes “being away.” It’s a small difference, but one with an underlying meaning. Levesque performs his own solo music, and also with Ottawa bands Jonathan Becker & The North Fields and Fresh Hell. He has plans to release a new solo album within the next year, this time in hopes of recording it with a full band rather than just him and his acoustic guitar. He’ll also have the privilege of playing this year’s Ottawa Bluesfest with The North Fields, which he still finds hard to believe. Levesque has been able to check a number of things off his to-do list — among them recording an album, touring the country, and now, playing a major festival — but he also appreciates the little things, like changing the brakes on a car, fixing things around the house, and even managing to several times drive a car to and from gigs that couldn’t go in reverse. It’s that resourcefulness that allowed him to pursue his passion over the years. “I was raised around music but never around instruments,” he says. He grew up listening to honky-tonk and country, but no one in his family ever played. See Jonathan Becker & The North Fields perform live at Ottawa Bluesfest on July 12 at 3:00 p.m. on the River Stage. You can listen to their music at jonathanbecker.bandcamp.com.